The Scoop: Most singles are self-taught in the art of attraction. Dating isn’t something we learn in school, so most of us are wandering around out there just making it up as we go along. That’s hardly an efficient way to approach one of the most important decisions in life, so forward-thinking dating experts at Toronto Wingwoman have made it a priority to close the information gap. They educate singles about the ways of love and set them up for romantic success. Toronto Wingwoman has launched knowledgeable dating coaching services and courses to help singles study up, improve themselves, and make the grade on their next date. Toronto Wingwoman, a dating consultancy in Canada, teaches singles how to navigate the modern dating scene. Its one-on-one dating coaching sessions have been remarkably effective and popular. However, not everyone has the time or money to invest in 10-12 in-depth consultations. Not everyone wants to spend months working on a solution, and not everyone needs such hands-on tutoring. Some singles would rather read the SparkNotes version and figure things out themselves. Candice Alstar, Founder of Toronto Wingwoman, saw an opportunity to grow her business by offering budget-friendly resources that would appeal to busy singles everywhere. Candice Alstar founded Toronto Wingwoman to support singles with action-oriented dating services. Under Candice’s leadership, Toronto Wingwoman is developing tools to help singles understand how to get the results they want in the dating world. The coaching programs package information in an easy-to-digest format and couple each lesson with weekly follow-up calls from a professional coach. Toronto Wingwoman’s self-guided programs will educate and empower daters to use online and offline dating strategies that have proven successful in the past. Dating education is key to Toronto Wingwoman’s founding mission, and the coaching agency has developed multiple intensive and informational services to raise awareness about the best practices on a date and in a relationship. The company’s new self-guided tutorials will give budget-conscious and busy clients a chance to brush up on their dating knowledge in their own time. The courses don’t just spout platitudes and common-sense tips — they challenge participants to take action in the real world. Toronto Wingwoman teaches its clients to date smart and find a perfect match. Each course has activities designed to help clients practice their skills and get results as soon as possible. These homework assignments invite singles to gain confidence in themselves and their ability to land a date. Once they see Toronto Wingwoman’s advice yield results, they’re much more likely to take its future lessons seriously. This hands-on approach to online courses sets the company apart from its competitors. Toronto Wingwoman offers valuable dating education with a personal touch. These dating experts don’t expect singles to figure it out for themselves but actually take the time to walk them through the process and see to it that they find success. Some clients choose to go one step further and join the waiting list to become a coaching or matchmaking client. Toronto Wingwoman only takes on a few singles at a time for its premium services because the team tailors these programs to fit the individual’s needs. “We evaluate every single person who wishes to take the program on a one-on-one basis to make sure it’s a fit for them and us,” Candice said. In addition to coaching, Toronto Wingwoman continues to offer its signature wingwoman services, which takes clients out on the town to get dates under their tutelage. The professional wingwomen accompany singles to social events where they introduce people and help break the ice in a casual and engaging way. The modern dating scene is fast-paced. The age of swiping has changed how singles view the dating landscape, and not always for the better. Online dating burnout has become more prevalent and has led the matchmaking and dating coaching industry to expand its reach to frustrated singles who are tired of wasting time on incompatible matches. In recent years, dating professionals have noticed more millennials are seeking them out in hopes of making dating easier and less time-consuming. Toronto Wingwoman has seen a significant uptick in the number of clients between 25 and 35 years old. Toronto Wingwoman’s candid and information-rich programs appeal to career-oriented singles who have become masters in their professional lives yet haven’t mastered dating. These wingwomen help singles come out of their shells and learn how to put their best foot forward in a variety of social situations. These coaches give singles the confidence to approach potential dates by arming them with knowledge. Candice told us the story of one shy single who didn’t know how to dress or what to say on a date. He took Toronto Wingwoman’s online dating course and later reported that he was getting more matches and engaging in more conversations that led to dates. He is now in a long-term relationship and credits the dating coach’s advice for his newfound success and happiness. Toronto Wingwoman isn’t standing still and waiting for someone else to come up with the next big thing. These leading dating experts are out there working to create the next big thing themselves. Candice told us that the future of matchmaking is in technology, and she is gearing up to offer a digital matchmaking service to meet the needs of the modern dater. This new service turns conventional matchmaking on its head by incorporating an algorithm-based approach. The technology will augment rather than replace the matchmaker’s human intuition. 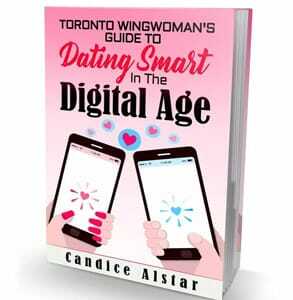 Candice wrote “Dating Smart in the Digital Age” to give modern singles valuable online dating tips. The digital matchmaking program will eventually draw from social media channels to find eligible daters and connect them with one another. The streamlined system won’t be 100% automated though — it will rely on the wisdom of a personal wingwoman vetting and screening potential matches. Candice said her team of matchmakers will ensure that the chemistry is right and the match makes sense. Personalized, hands-on dating coaching isn’t for everyone. Some singles would prefer a less time-consuming route to self-improvement. They’d like to get advice and reap the benefits of increasing their dating knowledge, but they just don’t have the time. That’s where Toronto Wingwoman’s self-guided tutorials come in. Rather than sitting daters down to teach them in one-on-one sessions, these experienced dating coaches have put together clear-cut study guides and weekly check-ins that go over the essentials and allow singles to learn and grow at their own pace. By putting information and resources in the hands of everday daters, Toronto Wingwoman intends to make the dating scene a more manageable and enjoyable place.